When visiting a restaurant one looks forward to a wholesome experience that comprises good food and drinks, great ambience and exceptional service. Having heard a lot about Pali Village Cafe my friend Amrita and I headed over to Pali Naka for an afternoon of fun and amusement. On arriving the host greeted and asked me if I had made reservations. He seemed put off that I had not made reservations and I could not comprehend what the fuss was all about as most of the tables were unoccupied. He then was willing to accommodate and asked me to wait by the bar area. The space was rustic it looked like a bungalow but I later learned that it was a furniture store that had been converted into a cafe. Despite being on one of the noisiest streets the cafe manages to shut out the chaos outside and transports you to a chic bohemian place. 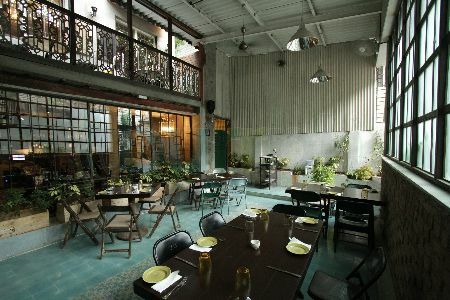 Wrought iron railings, exposed brick walls, eclectic tiles, vintage furniture and fabrics enhanced the charm of the space. The two level open space with high ceilings and large windows allow abundant natural light to penetrate and light all surfaces evenly. The lower space has a wall towards the back lined with wine racks with an extensive collection of wines. After Amrita arrived I apprised her of our situation and requested her to turn on her charm and request the host to seat us. Enamoured by Amrita the host seated us almost immediately. We were seated on a partial terrace overlooking the main floor. Within minutes of handing us our menus our server promptly appeared and requested we place our order. The menu was a European flare. We decided to skip drinks and appetizers. On asking the server if they had any house specials that day the server did not understand me and directed my attention towards the entrees on the menu. Our server was inattentive and inconsiderate as we had to constantly request him to refill our water glasses and he kept rushing Amrita as he tried clearing her plate several times. The cafe had quite a few vacant tables so we could not understand why the rush. In all the ambience was great but the food and service were definitely a disappointment. The space is free-spirited but lacks flavour. This entry was posted in Culture, Fashion, Food, Travel and tagged Bandra, Bombay, European, Food, Lunch, Mumbai, Travel. Bookmark the permalink. You’re my European flare, Jazzykins. You need to now make a trip to Bombay! And Amrita might not see this so I shall let her know.